A Thought Shared ....: Bridges, Bridges, Bridges.. 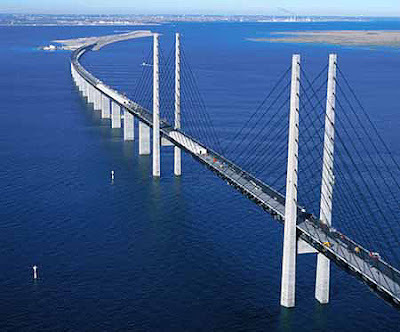 The Øresund Bridge-Tunnel is 15,905 metres long, and connects Malmo, Sweden, to Copenhagen, Denmark. The bridge is 7845 metres, Peberholm (Pepper Islet, so called because the islet to the right is called Saltholm), which connects the bridge to the tunnel is 4,055 metres, and the tunnel including the collector points and toll booths is 4,050 metres. The Monitor Merrimac Memorial Bridge-Tunnel crosses the James River, Virginia, connecting Newport News and Suffolk, and comprises of a curved 3.2 mile bridge section connecting to a 4,800ft tunnel. 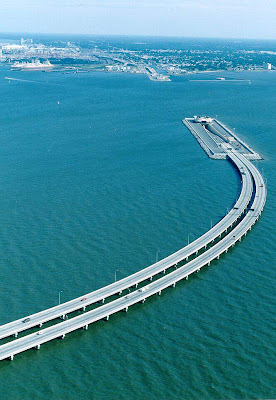 Aerial photos of this bridge-tunnel have been mistakenly reported as the Oresund Bridge-Tunnel, but as one can clearly see, the two constructions are quite different. 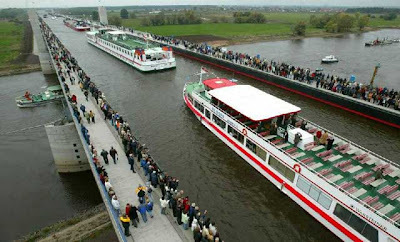 The Water Bridge close by the German city of Magdeburg ties the Elbe-Havel canal to the important Mittelland canal, which leads to the country’s industrial Ruhr Valley. At 918 metres in length, it is Europe’s largest bridge of it’s kind.